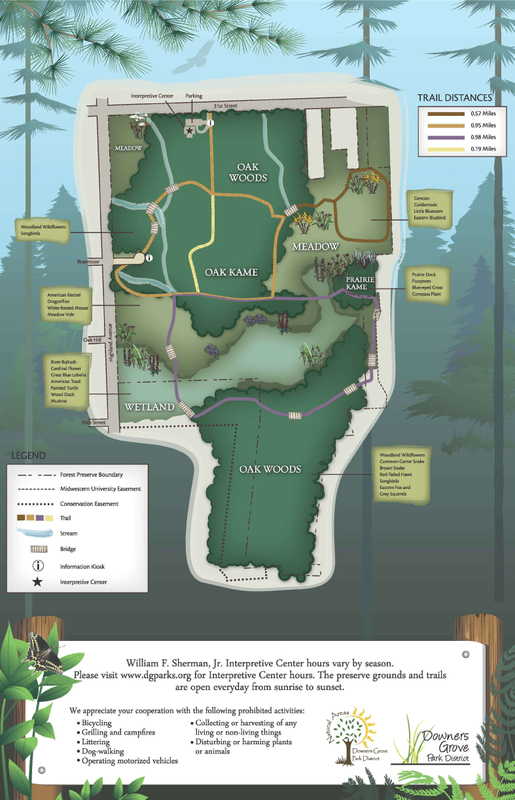 Lyman Woods is 150 acres of oak woods, prairie, and marsh habitats that supports over 300 species of native plants. Discover an amazing diversity of plant life, including six species classified as rare in the Chicago region. Catch a glimpse of animals including deer, coyote, fox, Cooper's Hawks, Great Horned Owls, a wide variety of reptiles, amphibians, insects, and numerous songbirds. During your visit, you'll find three rare kames, glacially deposited hills of gravel, which support native prairie and oak woods. The most outstanding feature is a 19-acre oak woods that has remained undisturbed since it was purchased by the Lyman family in 1839. Today it serves as one of the few examples of the pre-settlement landscape that dominated the Downers Grove area. The Interpretive Center is your starting off point for your exploration of Lyman Woods. Discover native landscaping, a butterfly garden, and rain gardens outside the building. Don't forget to look up and spot native prairie plants growing on the roof! Inside the William F. Sherman, Jr. Interpretive Center you will find changing exhibits and activities including an active observation beehive, programs, restrooms, drinking fountains and first aid. Bring a lunch or snack to enjoy at our outdoor picnic area. Feel free to ask questions of our talented naturalist staff about any plants or animals that you see. The preservation of Lyman Woods in 1987 represents the cooperative effort of the Village of Downers Grove, the Forest Preserve District of DuPage County, the Downers Grove Park District and many dedicated individuals. Please note: In accordance with the Illinois Nature Preserve Commission there are no dogs (excluding service dogs), bikes, or cross-country skis allowed in Lyman Woods. Thank you for your cooperation. Check out an Adventure Pack filled with gear to help you explore Lyman Woods! Choose from identification guides, bug boxes, magnifiers, and other tools and activities for your family or group to use free of charge. Check out your pack during Interpretive Center hours with a valid driver's license. Don't let the snow slow you down! Rent a pair of snowshoes at Lyman Woods and get out there to enjoy the winter woods! When there are at least four inches of snow on the trails, both adult and children's snowshoes will be available for use at Lyman Woods. Snowshoes are available during regular Interpretive Center hours on a first-come, first-served basis. The rental fee for each pair is $6 for a 3-hour rental. Credit cards, checks, and cash are accepted. Click here for snowshoeing status. (Restore, Educate and Preserve) is a volunteer group dedicated to restoring and protecting the Downers Grove Park District's natural areas. Land management workdays are held on selected Saturdays from 8:00 - 10:30 am. Volunteers must register at least one week in advance of the scheduled workday. Volunteer workdays can be arranged for organized groups upon request.